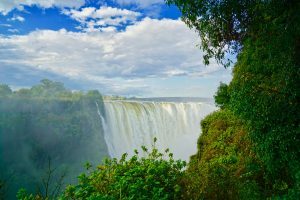 Victoria Falls in is one of the seven natural wonders of the world. I’ve been fortunate enough to visit some of the other wonders. With all the things going on politically, it makes one think of these wonders. Some have been destroyed. Some are in such dangerous places, one can’t really visit. Why destroy them? When you see the Falls from the air, it looks arid. I thought it would be in the middle of this lush jungle. But it was not at all like I pictured it. It looks like clouds of steam coming up from the earth. When I saw it, the Falls were running high. David Livingstone lived on the island now known as Livingstone Island at times when the Falls ran low. There’s also the Devil’s Pool (http://www.devilspool.net), where you can swim when the Falls are low. It’s like an infinity pool in a natural setting. The Falls are loud. The power of nature is amazing and makes you feel insignificant. It’s like staring up at a starry sky at night and feeling vast. This is not a picture of me; it’s one of my fellow travelers, getting wet as we view the Falls from the ground. Initially, I walked up the path to the the Falls (and got wet). But you can’t really comprehend the scope from the ground. We went right away. 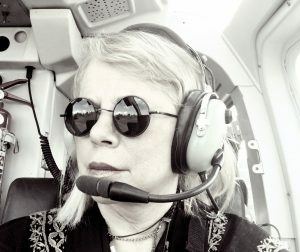 I sat in the co-pilot’s seat. From the air, I really got to see the scope, appreciate how fast it all is. I kept imagining Livingstone traveling, seeing it for the first time. What must it have felt like, his discovery? 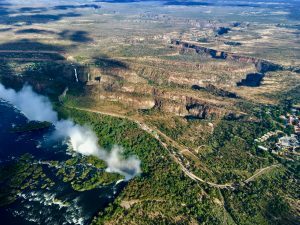 If you’re ever lucky enough to visit Victoria Falls, take a helicopter ride!